Eclipse Series 31: Three Popular Films by Jean-Pierre Gorin includes three films by the director: “Poto and Cabengo,” “Routine Pleasures,” and “My Crasy Life,” all three of which are reviewed below. How does a stranger in a strange land get to know his new home? Tune in the most popular station or head to the busiest mall to find what “everyone” is doing? Not if you’re Jean-Pierre Gorin. After spending the first part of the '70s in France as one half of the Dziga Vertov Group with Jean-Luc Godard (no word on which one was Dziga and which one was Vertov), Gorin moved to Southern California to teach at UC San Diego. Feeling suspended between two cultures (“I wasn’t French anymore, but I wasn’t quite American either,” he says in “Routine Pleasures”) Gorin turned his eye to the McDonald’s-sprouting landscape around him and discovered a few pockets of resistance to the dominant culture that were just begging to be filmed… or maybe not. Gorin’s investigation takes a circuitous route, but not because he’s trying to preserve the mystery – he says immediately that he believes their private language is merely a Creolized version of English (and, as it turns out, German), and later he proves it. 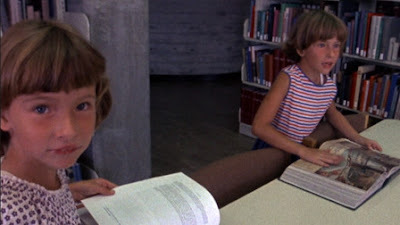 Rather, Gorin creates the impression of turning his camera (operated by the great documentarian Les Blank) in whatever direction the story takes him, whether letting the precocious twins lead him around by the nose, or noting of the parents’ total lack of awareness of class restrictions, a source of serious delusion and disappointment in late-'70s America. Gorin also seems to be keenly aware of the perils of his autobiographical impulse, and is constantly wary of turning his subjects into, well, subjects. After spending some time with the girls, he realizes, “Their story wasn’t with me. It was with their family.” He might be interested in understanding his new home; the twins just want to rush headlong into the next thing. Most striking, however, is Gorin’s attempt to recreate the aural landscape in which Poto and Cabengo grew up. A mid-Western father, a mother who speaks English with a suppressed German accent, and a German grandmother who spoke virtually no English at all help to explain the twins’ distinctive patois. But language plays an even more insidious role in their development. As soon as doctors applied the word “retarded” to the girls, the father (and presumably the rest of the family, and just about everyone else) began to treat them as such. Language truly is a prison. 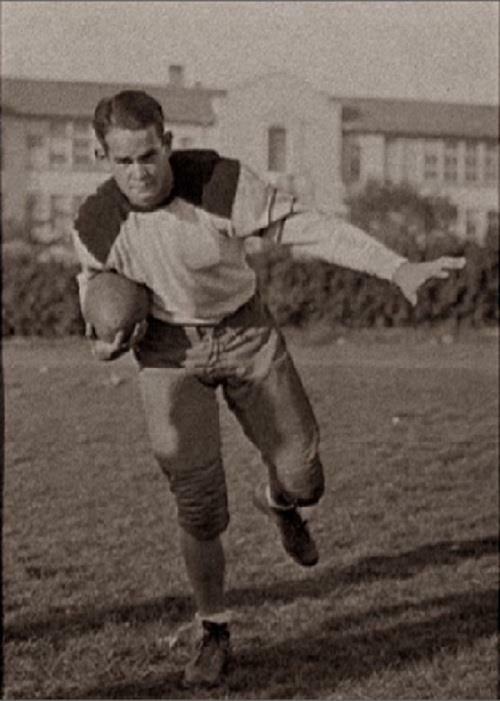 Gorin moved to America partially at the behest of film critic and painter Manny Farber who invited him to teach at UC San Diego. Farber has become a sacred totem among cinephiles today, and it appears that Gorin was just as deeply affected by the real man as younger critics are by the legend. In “Routine Pleasures” (1986), he plants tongue partially in-cheek by attempting to make a film designed to please a skeptical Farber, seen only in still photos (one non-routine pleasure for fans will be seeing Farber in uniform from his all-American football days) and via shots of his then-in-progress paintings. Gorin's ersatz cinematic gift to his hero is a documentary about a group of model train enthusiasts, though “enthusiast” seems like an insufficient term. So does fanatic. The men, all white and all middle-aged or older, collaborate on a rigidly structured fantasy world set in a playground that only a group of men old enough to feel nostalgia for “the good old days” could truly appreciate. 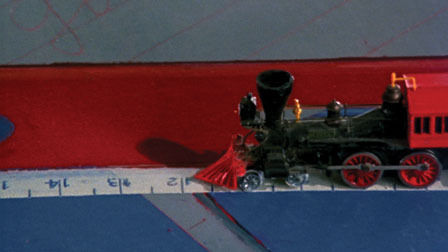 Gorin marvels at the hierarchical order of this society in which every man has an assigned role in the meticulous recreation of “real” trains (an entire massive tome is dedicated entirely to blueprints of a single train) and the efficient operation of these great American engines of commerce on the sprawling track they have built in a giant warehouse. Poto and Cabengo had Gorin wrapped around their little pinkies, and the director falls in love with his choo-choo men from the get go as well. Yet again, his affection makes him suspicious. Farber, perhaps speaking via Gorin, almost repeats a line from the previous film when speaking about the hobbyists: “They aren’t your things, and this isn’t your past.” And Gorin, while filming them at their controls (now with Babette Mangolte of “Jeanne Dielman” fame at the lens – it’s nice to be friends with the best and brightest) for the umpteenth time and comparing their procedures to the process of film-making (the carefully written train schedule as a script, etc. ), wonders, “Was I just looking for a metaphor for my work?” Perhaps this is navel gazing, but his concerns are central to the film. Any charges of exploitation have to be dismissed (though navel gazing remains on the table) when Gorin films his railway men in a totally blissed-out state while watching home footage of a real-life train thrumming along the tracks and venting steam. This is the mythical state of rapture audiences allegedly felt when first gazing at the Lumieres’ train arriving at a station. If Gorin is hoping to induce a similar state of stoner Nirvana in his guru, he has another think coming. Farber (at least as heard through Gorin’s sardonic narration – this could just be a post-production gambit by the director) remains obstinately unimpressed, even as Gorin tries to mold his train film into an homage to one of Farber’s favorites, Howard Hawks’ “Only Angels Have Wings.” Meanwhile, Gorin takes a journey through the mental landscape of Farber’s paintings, wonders whether it matches up with the imaginary landscapes of these nostalgic model-makers, and refuses to come up with any definitive conclusion on the matter. It’s all a wonderful mess that Gorin has the sense not to tidy up at the editing table. “My Crasy Life” (1992) sees Gorin returning to yet another Southern California sub-culture, the Sons of Samoa street gang of Long Beach. Gorin is no longer heard as the narrator, but this film is his most overtly stylized take on the documentary yet. The gang members are given center stage most of the time, frequently while performing raps or clearly performing staged interviews and even re-enacting crimes. A police officer patrols the area in a car equipped with a HAL-like computer voice that questions his every step. I readily admit that, as much as I love the first two films in the set, I’m not yet sure what I think of “My Crasy Life.” Kent Jones, writing the liner notes, states that the film “must be apprehended musically or not at all.” As with “Poto and Cabengo,” Gorin is interesting in producing an aural environment, and here he has players willing to collaborate with him, the music coming not just from their rap, but also from their accents and a sometimes florid, hyper-macho demonstration of what their various slang words mean. It’s quite absorbing, but I don’t know what the addition of other invented elements like the wry computer voice brings to this semi-ethnographic study. With his choice of subjects each existing in hermetically sealed spaces, Gorin is not interested in what THE people of Southern California are doing but what THESE particular people are experiencing. He isn’t looking for a mountaintop vista, but rather a view from the ground, an immersion in the specific sights and sounds of a specific place. And if he can stop to play or just chill out from time to time, all the better. All three films are presented in their original 1.33:1 aspect ratios. “Routine Pleasures” switches back and forth between black-and-white and colors, the other two films are entirely in color. Though Eclipse is a no-frills set, the progressive transfers here are very strong, exhibiting a strictly utilitarian look that works great for the first two films. “My Crasy Life” (also lensed by Babette Mangolte) is more colorful than the other two, but all of the transfers look good. All three films are presented in Dolby Digital Mono. I always feel silly saying things like “audio is essential to this film” (how could it not be?) but since Gorin is focusing on subcultures with distinct languages, a poor sound mix would be particularly damaging. Fortunately, the Mono mixes are surprisingly rich. I can’t attest as to what degree “My Crasy Life” sounds like it did when projected, but the musical qualities of the film certainly come through strongly here. Optional English subtitles support the audio. It’s a fair question as to whether your SHOULD use the English subtitles for “Poto and Cabengo” – you weren’t really intended to understand as much of what they say as you can get through the subtitles, so try it without the first time through. As with most Eclipse releases, there are no extras. Kent Jones provides excellent liner notes on each of the three films. Each film is housed in a separate slim case. All three cases are tucked into a thin cardboard sleeve. 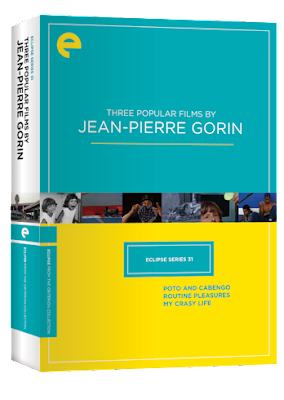 Jean-Pierre Gorin will probably forever be best known as Godard’s collaborator in the Dziga Vertov Group, and I suspect most viewers, like myself, have never previously had the chance to see any of Gorin’s solo directorial efforts. I was moved to write the following on Facebook: “Poto and Cabengo, where have you been all my life?” I felt similarly enthusiastic about the endless pleasures on display in “Routine Pleasures,” and I reserve the right to form an opinion about “My Crasy Life” at a later date. I love Gorin’s discursive approach. Kent Jones says the film are “militantly unclassifiable” but I don’t think you’d be committing a major sin to label them as essay films, while noting that the term is an extremely broad one. But where most essays start with a thesis and hammer home the argument in every paragraph, these essays open up more as they go along. I simply had no idea how great Gorin’s solo films were, and I suspect this is going to wind up as one my favorite DVD sets of the year.